The Twal Days o Yule is not the first Scottish version of the ‘Twelve Days of Christmas’. 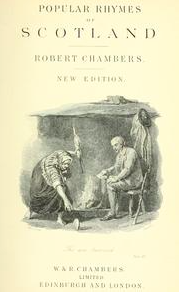 In 1842, Robert Chambers included a poem called ‘The Yule Days’ in the second edition of his Popular Rhymes of Scotland. In this earlier Scottish version (which has thirteen not twelve days of Yule, up to and including 6 January), the gifts are sent by the King to his lady and include some very exotic creatures: a papingo, the old Scots word for ‘parrot’, and even an Arabian baboon! Apart from the papingo, however, there is not much Scots in Chambers’s version (though he does rhyme ‘a bull that was brown’ with ‘Arabian baboon’, which suggests a Scots pronunciation!). A second Scottish version was published in 1892 by the artist, William Bell Scott. This included some (though again not many) Scots words and phrases, such as lads-a-louping, which I have echoed in my version, as lads-a-lowpin. The period of Yule or Yuletide is also known as the Daft Days in Scotland, and is the subject of a famous festive poem of that name by Robert Fergusson.